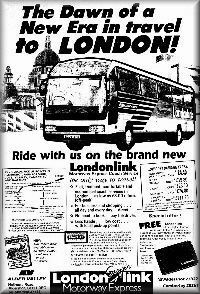 The name Londonlink was first used on the 5th October 1980 when the Alder Valley Farnham to London Express service which used the A30 route was re routed to use the M3 motorway and called X7 and X8. The X7 routed via Yateley and the X8 via Frimley. Vehicles used being Leyland Leopard coaches instead of the Leyland National dual purpose bus/coaches previously used. As well as the routes from Farnham and Aldershot there was also a Londonlink service from Reading and another from Newbury operated by Alder Valley North. 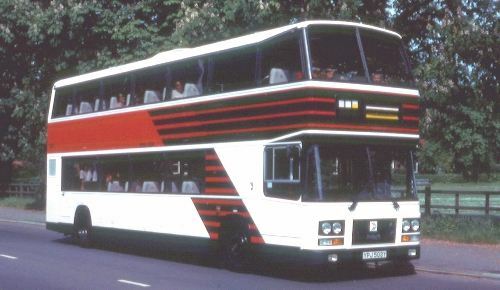 In June 1983 the service was upgraded to high quality coach bodied Leyland Olympian double deckers. These were launched at an open day at Aldershot Depot on 4th June giving free rides to show them off to the public. In all ten of these were purchased over a three year period, giving good service for many years. Olympian (YPJ 503Y) is at the Aldershot Open Day before entering service. In 1987 six Hestair Duple 425 integrals were added to the Aldershot fleet. These vehicles were fitted with Cummins engines and automatic transmissions and they really looked futuristic and did a good job in building up the service. However towards the end of Alder Valley's reign passenger loadings declined sharply partly due to increased traffic slowing the journeys down and partly due to terrorist threats in London which stopped people wanting to travel. When Alder Valley was sold to Stagecoach in 1992 Londonlink was not transferred to the new owner but retained by the previous owners, now called The Bee Line, and operated from their Bracknell depot. It still operates from there today but as a mere shadow of its former self with only a handful of journeys operating. The total number of journeys operated now is equal to the number operated before 7am in the Alder Valley heyday. on exhibition to prospective customers.